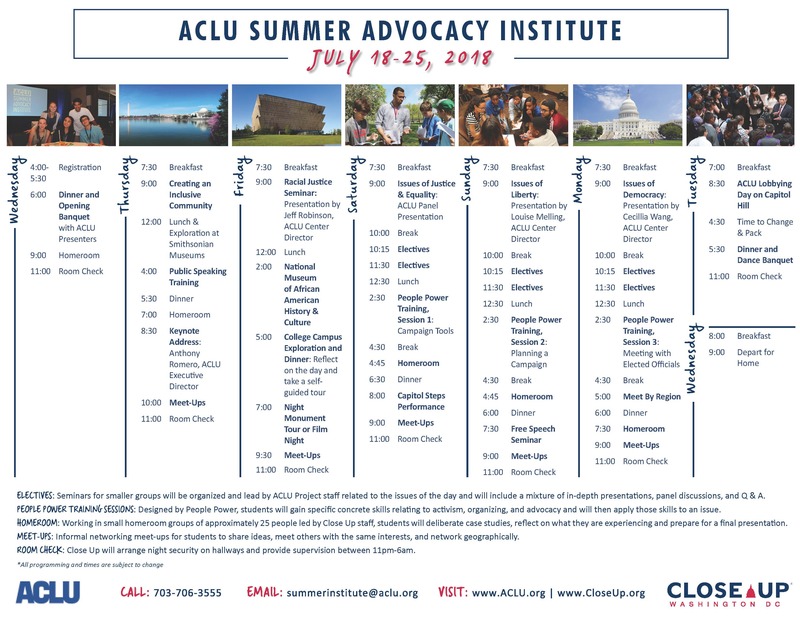 The ACLU Advocacy Institute’s Summer Advocacy Program will bring together a diverse group of high school students (ages 15-18) from across the United States to participate in a week-long, firsthand learning experience for the next generation of social justice advocates. The ACLU Advocacy Institute’s Advanced Advocacy Program will prepare college-aged students (ages 18-24) for lifelong engagement in grassroots organizing, policy development, and legal advocacy. This week-long program in Washington, DC is designed to engage Institute alumni, as well as other college students, to bring their advocacy skills and passion for campus organizing to the next level. Students will enhance their knowledge of civil liberties and social justice issues, as well as learn about internships and professional opportunities in public policy, law, communications, and social impact work to help them prepare for a career in the law and public service. New for 2019. Want to extend your time at the ACLU Advocacy Institute? Join other ACLU Institute students for a week-long exploration of Washington, DC, and New York City following the close of the Institute. New for 2019. Click the links below to learn more about these programs. Individual program applications can be found on the program pages listed below. Louise Melling is a Deputy Legal Director and the Director of its Center for Liberty, which encompasses the ACLU’s work on reproductive freedom, women’s rights, lesbian, gay, bisexual, and transgender rights, freedom of religion and belief, and disability rights. In this role, she leads the work of the ACLU to address the intersection of religious freedom and equal treatment, among their issues. Adina Ellis is an Associate Director of Strategic Communications at the ACLU. Ellis leads the communications and media outreach efforts for the organization’s criminal justice work, including the Campaign for Smart Justice - an initiative designed to significantly reduce the U.S. jail and prison population. As a whistleblower of illegal government activity that was sanctioned and kept secret by the legislative, executive, and judicial branches of government for years, he undertook great personal risk for the public good. And he has single-handedly reignited a global debate about the extent and nature of government surveillance and our most fundamental rights as individuals. Gara LaMarche is President of The Democracy Alliance, a group of donors and movement leaders who provide millions of dollars to strengthen progressive organizations, causes and campaigns. A longtime advocate for human rights and social justice, from 2007 to 2011, he was President and Chief Executive Officer of the Atlantic Philanthropies, an international foundation focused on aging, children and youth, health, and human rights operating in Australia, Bermuda, Northern Ireland, the Republic of Ireland, South Africa, the United States, and Viet Nam. During his tenure at Atlantic, the foundation made the largest grant ever made by a foundation for an advocacy campaign – over $25 million – to press for comprehensive health care reform in the U.S.
For nearly 100 years, the ACLU has been our nation’s guardian of liberty, working in courts, legislatures, and communities to defend and preserve the individual rights and liberties that the Constitution and the laws of the United States guarantee everyone in this country. Whether it’s achieving a 50 percent reduction in mass incarceration by 2020; challenging police brutality nationwide; establishing new privacy protections for our digital age of widespread government surveillance; or preserving the right to vote or the right to have an abortion; the ACLU takes up the toughest civil liberties cases and issues to defend all people from government abuse and overreach. With more than a million members, activists, and supporters, the ACLU is a nationwide non-partisan nonprofit that fights tirelessly in all 50 states, Puerto Rico, and Washington, D.C., to safeguard everyone’s rights. The Institute builds upon this tradition to directly engage youth in becoming civil liberties advocates in their own right. Since 1971, this nonprofit, nonpartisan organization has partnered with schools and organizations across the country to inform, inspire, and empower young people to exercise the rights and accept the responsibilities of citizens in a democracy.